Would you travel from St. Petersburg to Moscow… by scooter? Rendakov is thinking of making a scooter trip to Sevastopol in Crimea. Strong legs, friendly locals and not being too picky about where you lay your head – these are the keys to a successful 450-mile journey between Russia’s two largest cities on a scooter. “Why did I do it? And why not?” is 26-year-old Alexander Rendakov’s response when asked why in July 2016 he decided to travel 450 miles (730 km) from St. Petersburg to Moscow on a scooter. During his journey, Rendakov suffered a tendon rupture, spent a night in an abandoned village, drank hooch with a village electrician and burst into tears in Red Square. A long-term and enthusiastic scooter user, Rendakov even belongs to a scooter club called Let's Kick. His attitude to scooters is a reverent one: He is convinced that it was buying a scooter that dragged him away from his computer and introduced him to a more active lifestyle. Having reached his destination, utterly exhausted, Rendakov circled around the town for 12 more miles: He had set himself the target of covering 120 miles. Once he was back home, he said that journeys like these were “an idiotic idea.” Yet soon he began preparations for an even more serious challenge, a scooter journey to Moscow. Rendakov was keen to visit Moscow, having read the book Metro-2033 (a post-apocalyptic adventure novel set in the Moscow metro). In the winter of 2016, he took the plunge: He resigned from his job as a special vehicles driver and started preparing for his Moscow adventure. Later it turned out that Rendakov in fact underestimated his strength: Instead of the expected week, he reached Moscow in just six days. For his ambitious journey, the scooter fanatic packed a tent, a parka, a smartphone battery pack, a raincoat, wheel bearings and an Allen key (in the event of a problem). On Jul. 21, 2016, Rendakov set off from St. Petersburg, got on the M10 highway and began the journey to Moscow. “There was euphoria, a feeling like when you buy something you have been dreaming about for a long time,” he said. Rendakov spent 10-12 hours a day on his scooter. He did not take even his MP3 player with him, so he spent the time thinking, pondering various philosophical matters. The nights were spent in abandoned villages on the side of the road. Some turned out to be not abandoned: He then had to explain his journey to suspicious villagers. “They called me a fool,” he said. “But they did help me and were the first to talk to me.” The villagers fed Rendakov with buckwheat and put him up for the night. In the village of Vydropuzhsk (153 miles to the north of Moscow), Rendakov got talking to a local electrician and ended up drinking hooch with him. 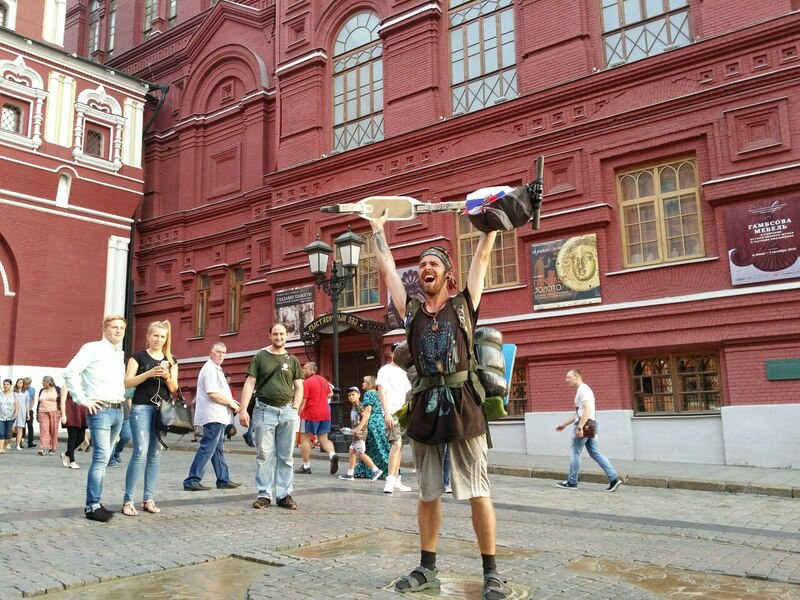 Over the six days of his travels, Rendakov spent just 3,000 rubles ($45), or about seven dollars a day. He washed his clothes in rainwater and ate wild berries and fruit. Most of the money went on energy foods and drinking water. On Jul. 26, Rendakov reached Moscow. The euphoria was gone: He was sunburnt, aching all over and dying of thirst. Even before the finish line, the exhausted traveler was surrounded by reporters: His fellow Let's Kick members had publicized his adventure in the media. Rendakov is not yet ready for new adventures, although he is thinking of making a scooter trip to Sevastopol in Crimea. But that is unlikely to happen before 2018. First, the Kerch bridge needs to be completed (linking Crimea to mainland Russia): Rendakov prefers not to travel via Ukraine. And he wouldn’t mind having a proper rest either.